Friday's World News on ABC paid tribute to the 70th anniversary of the D-Day invasion of Normandy with an emotional look at one of the remaining veterans who survived the hellish landings on Omaha Beach. However, the Big Three newscast made a historical gaffe during anchor David Muir's introduction to the segment. DAVID MUIR: Of course, now to the other major story around the world tonight, D-day, and our heroic troops in Normandy. This was the scene, Omaha Beach, 70 years ago today. And tonight, just look at the same beach – the American flag there. The single black and white photograph of Emlyn John wading ashore on the Normandy beach on that fateful morning of June 6, 1944 - D-Day - is one of the most iconic images of the Second World War. Weighed down by his waterlogged kit, his tunic part unbuttoned, the bespectacled 22-year-old steps carefully on to the beach in a picture which came to symbolise the immense courage and dignity of the 156,000 Allied soldiers who landed in France on that single day, 65 years ago this year. Emlyn John, from Churchdown in Gloucestershire, was an engineer. His role was to support the men of 48 Royal Marine Commando, men who had already left the craft and were in front of him on the beach near St Aubin-Sur-Mer as he descended from the vessel - many of them already lying dead or wounded, butchered within seconds by German machine gun fire and artillery. Charged with keeping the Marines' machinery and weapons working in the heat of battle, it was selfless men like John who put themselves in harm's way and changed the course of history on that terrifying, chaotic but inspiring day, more than six decades ago....John couldn't even swim, and was desperately afraid not just of the enemy fire raking the beaches ahead of him, but also of losing his glasses. The photograph does not reveal that Emlyn, the son of a coal miner, from Tonypandy in south Wales, and whose family had moved to the English countryside when he was a boy, was a devout Christian. The truth is that he struggled with his conscience and never wanted to kill - yet he went on to win the George Medal for valour. But when called to duty, John never flinched from the battle. He made it across Juno Beach with the surviving men of the Royal Marines, alongside Canadian troops that faced no fewer than 14 heavy batteries of 155mm guns and nine medium batteries of 75mm guns. The forces landing on Juno also had to contend with machine-gun nests, pillboxes, concrete fortifications and a sea wall twice the height of the one at nearby Omaha Beach. 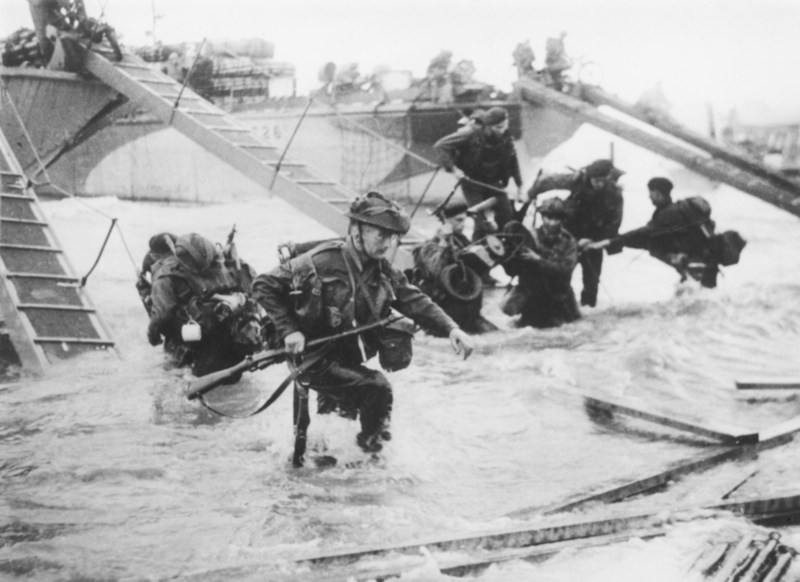 The first wave of men arriving on Juno suffered 50 per cent casualties, the second highest among the five DDay beachheads. It's been estimated that 2,700 British soldiers were killed on the Normandy beaches that day. But Emlyn was one of the survivors, fighting his way through France and Belgium in the two months that followed, until suffering a shrapnel wound in August and being shipped home. Within weeks of being injured, however, he was back with his unit, once again supporting the Marines, and although he was allowed a brief compassionate leave to marry his wife Clare, he ended the war among the ruins of Berlin. In fact, John didn't actually see the iconic image of him jumping on to the beach until shortly before he died of cancer in 1995, at the age of 74.